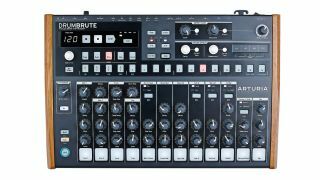 Released at the back end of 2016, the DrumBrute takes Arturia's experience in designing its BeatStep controllers, and mixes in the philosophy of the Brute range, providing a small-footprint, high-quality, analogue drum synth for a reasonable price. The DrumBrute's Copy and Erase buttons work on Bank, Patterns and individual drum tracks. You can also Spot Erase individual steps in real time by holding the Erase button and hitting the relevant pad. The sounds associated with each of the DrumBrute’s 12 pads are accessible via separate outputs – simply plug a minijack into a sound’s output, and the associated sound is removed from the main mix (along with the filter in the signal path). You may have noticed that the DrumBrute has 17 parts across 12 pads, so some sounds – while individually programmable – share an output. Rim and Claves, Toms and Congas, and Maracas and Tambourines. The exception is the Hats, which share both a mute group (the closed hat will always mute an open hat) and output. The DrumBrute's pads transmit and record the full 127-point velocity scale, but the internal sounds respond only to ‘normal’ and ‘accented’ notes, the effects of which are determined by the Accent Velocity Threshold parameter in the MIDI Control Center software. The sounds themselves normally switch between quieter and louder versions (when played above the accent threshold), though the Accented version of some exhibit slight timbral changes too – for example, Kick 2 has a more noticeable ‘click’, and the Rim changes timbre as if the ‘Rim Tone’ parameter is being moved. Repurposing sounds allows you to up your Tom count. Lower Kick 2’s Decay to 9 o’clock and it'll immediately fit with the Hi and Low Toms. You can even create four-note basslines using the Toms and Kicks simultaneously. Alongside its internal clock, the DrumBrute can sync (to and from) a large range of other gear via MIDI clock or USB. Analogue sync pulses are sent and received via a pair of rear-panel minijack connectors (Clock In and Clock Out), and the MIDI Control Center software adjusts the clock rate. Options include, amongst others, Volca- and DIN-compatible rates. You can also turn on Auto-Sync, to switch to whichever source begins sending clock data to the DrumBrute. Note also that the clock ports carry both clock pulses and start/stop messages, though you may have to make up your own cable to make use of them. The DrumBrute’s main output can be processed by the resonant output filter (high- or low-pass). This, like all other sound-editing and manipulation parameters, cannot be automated internal or externally. The DrumBrute lends itself to tweaking on-the-fly, then, but if you want any sort of after-the-fact dynamic control, the best tactic is to record it through your DAW. For elaborate tweaks, loop the pattern and Solo each instrument for recording in turn. Keep the DAW running while you finesse the required changes, then select the best takes afterwards. It's not a glamorous thing to do, but keeping your firmware updated means that your DrumBrute will stay up-to-the-minute, giving you fixes for any bugs, and potentially extra functionality with each update. The metronome sound gets it own output, and it’s also removed from the main output when headphones are used. The sound is then routed to the headphones for tempo monitoring in a live situation. The MIDI Control Center is useful for managing and programming the ’Brute, but it's not simply a utility. It also allows access to extra features like the Step Repeat Randomizer, which can glitch up your sequences. 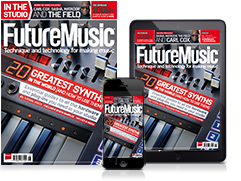 You can get more DrumBrute wisdom, including step-by-step walkthroughs and tutorial videos, in Future Music issue 318.